Gravity liquid fillers or pressure liquid fillers are designed to fill containers using pressure of the liquid. Pressure on the liquid is created by either gravity or through the displacement of a pump. Gravity liquid filler or pressure liquid filler machines and equipment are designed to fill liquid into a container through nozzles. The nozzles on a pressure / gravity filler is designed to insert into the neck of the container while a collar makes contact with the neck of the container. The force of the neck pushing up on the collar causes the nozzle to open and to fill the container with product. The product is held under pressure either in a product holding tank above the filling nozzles or by pumping the product into the individual nozzles above the filling point. The nozzles on a gravity / pressure filler are designed to fill the container to a certain level above the fill nozzle, to a point where the pressure necessary to fill above that point just exceeds the pressure of the liquid entering the nozzle. Any excess product at this point is re-circulated through the nozzle and into a product hold tank for subsequent filling. Once the container has been filled, the gravity / pressure filler raises the nozzles out of the neck of the container. When the collar stops making contact with the neck of the container, the nozzle will close and prevent any further product from dispensing. Gravity / pressure liquid fillers can be used to fill different size containers because of their simply design. The same pistons on a gravity / pressure liquid filler can be used to fill different size containers or to fill different volumes within the container so long as the filling nozzle fits within the neck of the container. Gravity / pressure liquid fillers can be adjusted to fill to different levels by changing the spacers on the collar on the filling nozzles. The wider the spacers on the filling nozzles, the higher the nozzle will be inside the neck of the container, and the higher the product level of the final fill. The narrower the spacers on the filling nozzles, the lower the nozzle will be inside the neck of the container, and the lower the product level will be inside the container. Gravity / pressure liquid fillers can be designed to be inline or rotary. Specifications- Liquid, Gravity, Plastic, Rotary, Heads 15, Container height to 10", : Fully automatic gravity/pressure filler capable of filling up to 150 cpm. Designed for lightweight/narrow neck plastic bottles with max bottle size range of diameter (round) 5 5/16" (rectangle) 4 15/16" and max height of 10". Unit currrently equipped with 1/2" dia nozzle set on 6" centers and centering bells. Has level sensing filling system for a automatic/uniform volume fill. 28 Head, stainless steel, gravity pressure filler. Containers size: up to 5" in Diameter; up to 10-3/4" in Height. Equipped with screw to star wheel in feed, 5/8" nozzles set on 5-1/2" centers, with centering guides, no bottle / no fill and star wheel discharge. Conveyor track designed to integrate into existing convey system. Speeds dependant on materials and application. Automatic, large frame, 32-head rotary, level sensing, liquid filler capable of up to 360 containers per minute. Containers: up to 5 1/8" diameter (5" rectangle). Has 6" pitch, 4"W x 109"L product conveyor, wormscrew to starwheel infeed, starwheel discharge, 5 3/4"L x 5"W container platforms, 7/16" OD multi-port nozzles, neck centering guides, product hold tank with stainless steel ball float valve, positive anti-drip product tubes, 304 stainless steel product contact parts, no container / no fill / no blow down, variable speed drive controller, and ratchet winch to lift head. Kaps All, Model FA-R-24, automatic, 24 head, stainless steel, rotary pressure filler rated from 60 to 240 containers per minute – depending on materials, application and machine configuration. Container size: up to 4½" in Diameter: up to 12" in Height (with proper change parts). 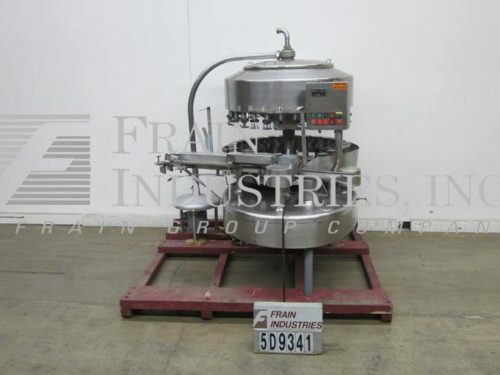 Equipped with worm screw to star wheel in feed and discharge, 46" OD table with (24) (5/8)" OD stainless steel nozzles set on 5" centers, no container / no fill and 43" long x 12" wide x 16" deep product reservoir. Control panel has AB PLC with an AB PanelView 600 touch screen HMI and push button start / stop. Mounted on a (4) leg frame with safety door guarding. Horix Model HBP 9-18-59, Automatic, 18 head, rotary, pressure gravity filler with number of containers per minute – depending on materials and application. Maximum container diameter: 6-1/2" on round and rectangle containers and height per application and machine configuration. All stainless steel contact parts. Equipped with 140" long x 4-1/2" wide plastic Delran product conveyor with worm screw to star wheel in feed and discharge and container guide rails, 30" OD turret, has (18) 5/8" OD nozzles set on 5" centers with 7-1/2" long x 6-1/2" wide rising container pedestals for bottom up fill, no container / no fill with overhead product feed system. Control panel has filler and conveyor start, stop switches and start, stop, e-stop push buttons. Mounted on heavy duty base frame. Never used in production! Fully Automatic 10 head Promatic/Gravtronic filler capable of speeds over 200 CPM. Has 10 Mass Flow Meters (Andres & Housen) to provide filling accuracies of +/- 0 .1%. Eight of the heads were used for filling 10 – 60ml containers at 200 CPM and two heads were used for filling 2.5 and 4 ML containers. Machine is expandable to 14 heads. Has 316L contact parts. Includes Microdose nozzles that have positive shut off for higher viscosity products: Also includes a set of 8 pinch valves for free flowing products. Filling range up 260 ML.. Has timing screw infeed system with no container no fill. Taylor touch screen controller with menu to hold up to 100 recipes. Includes Waukesha pump to supply manifold with product. Capillary Nozzles, Flow meters fulfill the general EMC (Electromagnetic Capability) requirements. Last ran 2.5,4, 5, 10,15,30 and 60 ML pharmaceutical suspensions and liquids. In line, 12-head, pressure filler. Equipped with 4-1/2" wide conveyor with adjustable side rails, twelve spout fill manifold currently set with six 3/8" OD nozzles mounted on 65" long height adjustable slide bar & product tank with float valve level control. Can handle water-thin foaming or non-foaming to medium viscosity fluids. All stainless steel contact parts. Speeds dependant on materials and application. Laub Model RLF40PG, 40 head, rotary, pressure gravity overflow filler rated from 75 to 400 containers per minute – depending on materials and application Fill range: ounces to gallons of free flowing to semi-viscous liquids, with accuracies of +/- 1/4 of 1% depending on product. Maximum container size: up to 6-1/2" in Diameter; up to 12" in Height, capable of handling glass, plastic and metal containers. Equipped with container conveyor, worm screw to star wheel in feed and discharge, 100" OD turret with 40 top driven pressure gravity filling stations with 3/4" OD nozzles titanium & PVC top-fill poppet nozzles set on 7-1/2" centers. Control panel, with A/B PLC and touch pad controller. Automatic 12 station, top driven, rotary pressure gravity filler capable of speeds up to 100 cpm depending upon application. Features a 30" diameter turret with filling stations with 12 filling stations on 8-1/2" centers and 5/8" nozzles. Maximum container diameter of 4". Star wheel infeed with a 80"L x 4"W conveyor and with a 3"diameter inlet/outlet. Automatic 8-head rotary gravity filler with 6" centers capable of up to 100 containers per minute. Equipped with Stainless Steel contact parts with 1/2" nozzles, starwheel in/out feed, controller for conveyor speed and fill speed, automatic overflow return tank with float valve, instant adjustment for lowering or raising entire nozzle head to accomodate containers of various heights and centering cups which assure positive placement of container under the filling nozzle. Capable of filling plastic, glass or metal containers. Last doing a 71ml fill into a plastic continer 4"H x 1-1/2"Dia . Liquid gravity pressure filler capable of speeds up to 150 cpm. Fully automatic rotary filler designed for lightweight/narrow neck plastic bottles with a maximum diameter of 5 5/16" (ROUND) and 4 15/16" (RECTANGLE), maximum height of 10". Has a fill range from 1 1/2oz to gallons. Unit is set on 6" centers and equipped with multi-port 1/2" nozzles, centering bells, metering devices, level sensors, and bottom-up fill for uniform volume fills, no container/no-fill and worm to star to worm infeed/discharge. Was last running shampoo in a cosmetic operation. Automatic, stainless steel, inline, 4-head, bottom-up fill, time / gravity liquid filler. Equipped with 150" long by 3-1/4" wide variable speed conveyor, 1/4" diving nozzles with 14" adjustable dive distance, pneumatic pinch flow cut-off, three level sensors, individual volume set points for nozzles and E-stop. Mounted on stainless steel frame with height adjustable legs and locking casters. Speed dependant on materials, application and machine configuration.